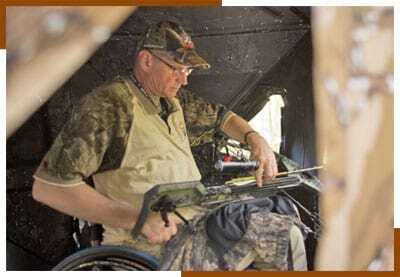 Deer Hunts for Wheelchair Bound Disabled Hunters! (or deer hunter wannabes!) looking for a quality & accessible outdoor experience! good food & conversation, have plenty of fun, and possibly even harvest a deer with a crossbow! Steve and Kristi Nooyen are the owners of the Wheelchair Whitetails, LLC property in northeastern Wisconsin. Steve is an avid outdoorsman and loves to fish, hunt, and hike. For more than 20 years he has volunteered to assist the young, elderly, and disabled to have quality outdoor experiences. for the benefit of wheelchair-bound individuals through a program called Wheelchair Whitetails. We offer guided whitetail deer hunts to disabled hunters on our 519 acre private property in Florence County, Wisconsin. The three day hunts are available to up to 20 hunters per year and are provided at no cost to successful applicants. Hunts are conducted with crossbows only. We provide the crossbows, or bring your own! No prior crossbow or hunting experience is necessary! Hunts are conducted from late September to November. These are fair chase hunts on private property. No fences! Hunts are conducted from 6' x 6' wheelchair accessible ground blinds. Accommodations and meals provided at no cost. Enjoy our comfortable, modern, fully accessible cabin. Each hunter is required to have one companion along for assistance.